In the case of Onkyo A/V receivers, "entry level" means a whole lot more than just affordability and standard functionality. You won't find a better example than the TX-SR506, which also offers high-definition media capability and advanced sound correction technologies. With an HDMI platform handling 1080p video from three sources, the TX-SR506 brings polish and peak performance to high-definition displays and sources. Legendary Onkyo amplification drive and power set the foundation for delivering bass crunch and vocal clarity. And, thanks to the latest Audyssey technologies, you get to enjoy a sweeping soundstage even at low volumes. 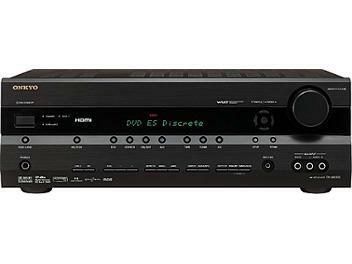 Easily holding its own among higher-priced A/V receivers, the TX-SR506 adds serious impetus to entry-level home theater. * A separate audio connection is necessary to process multichannel audio.